A community meeting was held on Friday 24 October to inform the public about the upcoming publication of the cadastral map for Tibar Bay. Sorumutu entre ekipa governu ne’ebe servisu iha projetu Portu Tibar ho komunidades iha Tibar halao ba dala tolu iha sesta feira, dia 24 de Outubru. Objetivu husi sorumutu ida hodi fahe informasaun ba komunidade sira kona ba publikasaun mapa kadastral Portu Tibar Bay nian. Members of the community are encouraged to check the maps and ensure that their claims are correctly recorded within the 30 day display period. The map will also be published in Jornal da Republica. Representante ekipa tékniku inter-ministerial ne’ebe sevisu iha projetu Portu Tibar nian sei marka presenja iha edifísiu departamentu Floresta nian durante loron servisu husi Segunda to’o Sesta feira iha oras 9-12 meudia (la inklui fim da semana ho loron feriadu). Husu atu komunidade sira iha Tibar mai check mapa ne’ebe publika atu nune’e se karik iha keisa ruma bele grava ka hakerek durante 30 dias publikasaun. Data Publikasaun ba Mapa Kadastral tau mos iha Jornal da Republica. to identify any claims on the neighbouring land that may be indirectly affected by the construction and operation of the Port. It should be noted that this is the largest part of the area mapped. prepare adequate mitigating measures to minimize the impact of Port construction and operation on adjoining land users and the environment. 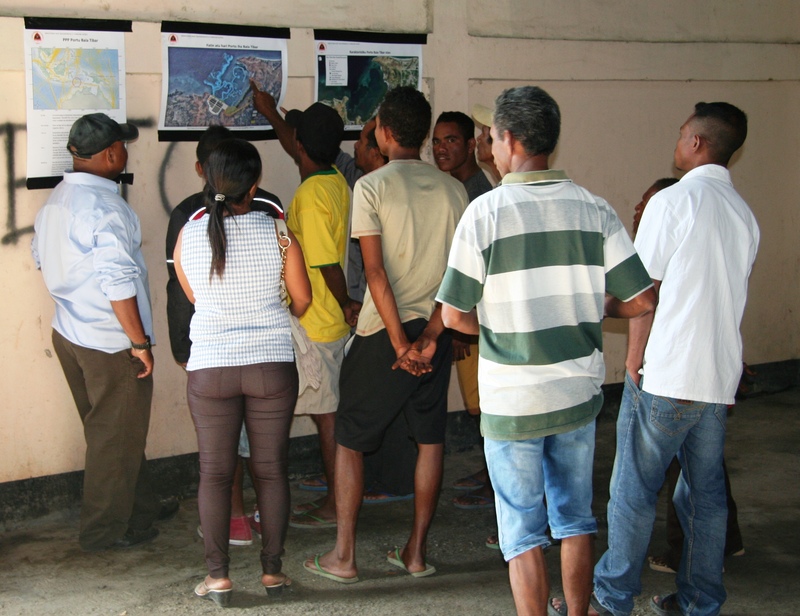 On August 1, 2014, a meeting was held in Tibar with the community to inform about the data collection for the cadastral and social mapping of the area. 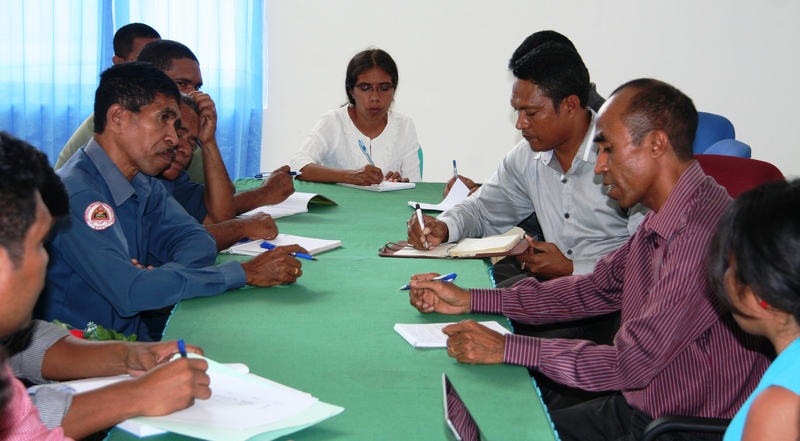 The meeting was chaired by Ministry of Transport and Communications, with the participation of about 65 members from the Tibar and Ulmera sucos as well as the sub-district administrator of Bazartete. The community was cooperative and willing to meet with the members of the Technical Team conducting the data collection. 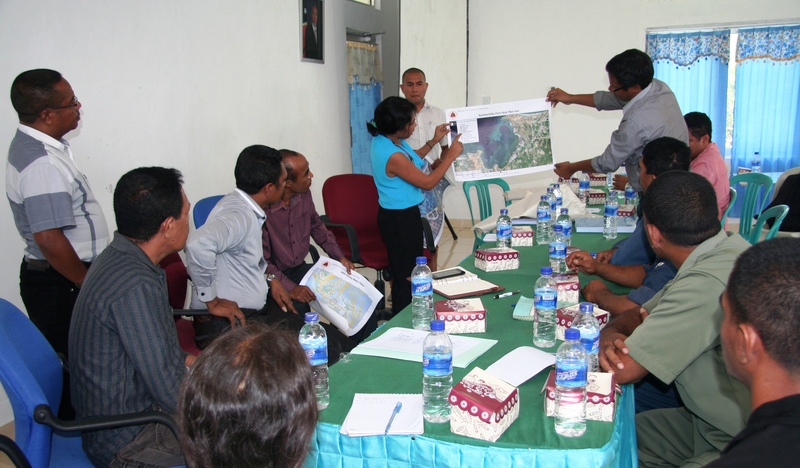 This took place in August and September with teams from Secretary of State of Fisheries, Ministry of Social Solidarity, Secretary of State for Arts and Culture, and National Directorate for Land, Property and Cadastral Services under the Secretary of State for Land and Property, Secretary of State for Environment and Secretary of State of Professional Training and Employment Policy. The results of the cadastral and social mapping will be published shortly. Atu identifika deklarasaun ruma husi rai sira ne’ebe besik mai Portu Baia Tibar ne’ebe sei afeta indiretamente husi konstrusaun ka operasaun Portu Tibar. Iha dia 1 de Agustu, 2014, ekipa tékniku husi ministériu relevantes servisu ba asuntu ida ne’e, hasoru malu ona ho komunidade iha Tibar hodi informa kona ba data komesa rekolha dadus ba mapa kadastral no mapa sosiál iha area ne’ba. Iha sorumutu ida ne’e lidera husi Ministeriu Transporte no Komunikasaun ho partisipasaun maximu husi komunidade iha suku Tibar no Ulmera, mais ou menus ema hamutuk 65 pessoas mak halibu an iha ne’eba, ida ne’e inklui mos Administrador autoridade lokais sira iha area Bazartete. Komunidade sira iha area ne’eba kopera ho diak tebes no hakarak atu hasoru malu ho ekipa tékniku ne’ebe sei foti dadus. 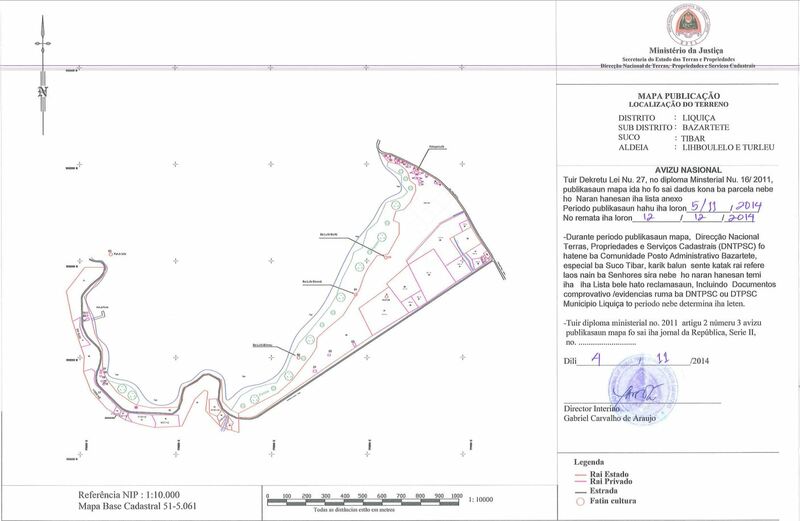 Dadus ba mapa kadastral no mapa sosiál hahú foti ona iha fulan klaran Agustu no Setembru 2014 nia laran ho ekipa husi departamentu peskas husi Secterario estado dos Peskas, Ministeriu solidariedade sosiál, departamentu kultura husi Secretario de Estado de kultura, Diresaun nasionál Terras e Propriedades no kadastral husi Secretario de Estado Terras e Propriedades, departamentu Ambiental husi Secretario de Estado de Ambiente, no ekipa husi SEPFOPE. Resultado mapa kadastral no mapa sosiál sei publika iha tempu badak nia laran. 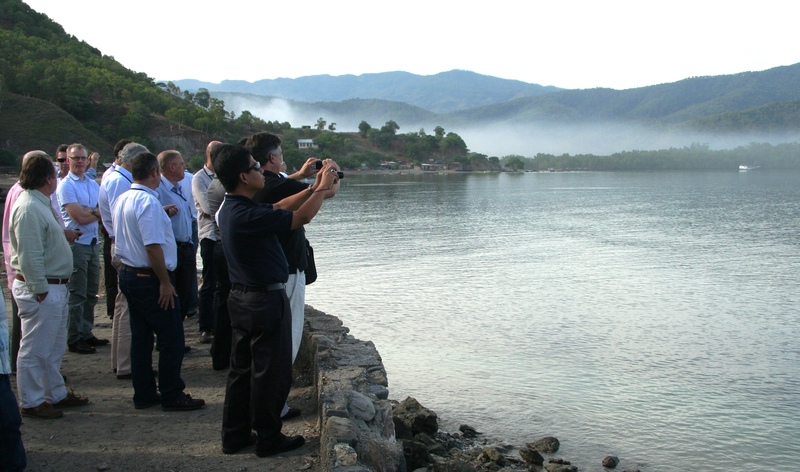 The Government of Timor-Leste hosted a meeting for the Pre-Qualified Bidders in Dili 17-19 June. The Meeting included a site visit to Tibar Bay in the morning of June 18. Governu Timor-Leste halao sorumutu ho kompanha lisitante hat iha Dili iha dia 17-19 Junhu. Sorumutu ida ne’e inklui mos visita ba Baia Tibar iha dia 18 de Junhu. All the four prequalified bidders attended: 1) Mota-Engil – Ambiente e Serviço, SGPS, S.A. (MEAS), 2) Peninsular and Oriental Steam Navigation Company (POSNCO), 3) International Container Terminal Services Inc. (ICTSI), and 4) Bolloré Africa Logistics (Bolloré AL). Kompanha lisitante hat ne’ebe mak atende sorumutu ne’e mak hanesan: 1) Mota-Engil – Ambiente e Serviço, SGPS, S.A. (MEAS), 2) Peninsular and Oriental Steam Navigation Company (POSNCO), 3) International Container Terminal Services Inc. (ICTSI), and 4) Bolloré Africa Logistics (Bolloré AL). Staff of Major Projects Secretariat of Ministry of Finance, the National Procurement Commission and IFC were available for information. Ekipa organizador husi Secretariado dos Grande Projetu (MPS), Ministerio dos Finansas, Comisaun Nasional Aprovisianamentu (NPC) no IFC prontu hodi responde ba informasaun ne’ebe mai husi kompanha lisitante hat. 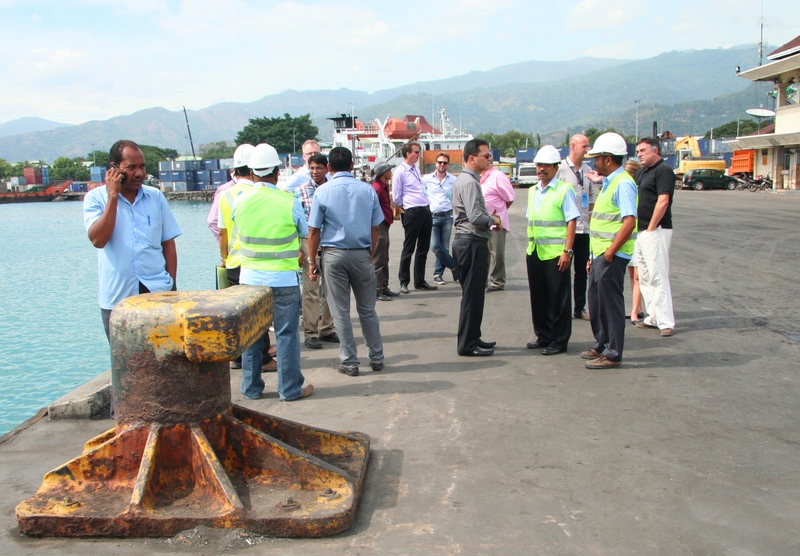 The visit also included a stop at the Dili Harbour, where National Director of Aportil, Sen. Lino Barreto welcomed the bidders and answered questions. Partisipantes husi kompanha lisitante hat no mos ekipa organizadora visita mos Portu Dili ne’ebe akompanha husi Diretor APORTIL, Sr. Lino Barreto ne’ebe fo bem vindo ba lisitante sira no fo informasaun kona ba situasaun portu Dili no responde perguntas ne’ebe hatoo kona ba Portu Dili. 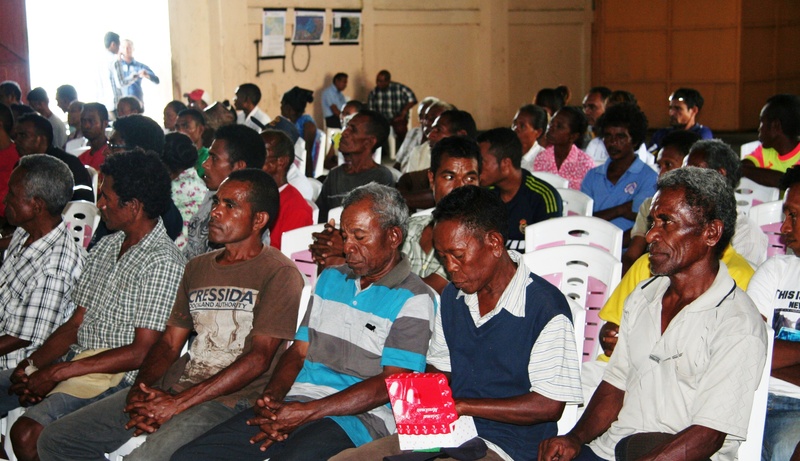 The first meeting with the community of Tibar was held on June 11, with about 120 persons from Tibar attended the meeting. The meeting was opened by the District Administrator, Sr. Domingos da Conceicao dos Santos, and welcome was also given by sub-district administrator of Bazartete, Sr. Augusto Perreira de Araujo. The chefe suco of Tibar, Sr. Bento da Conceicao, and Ulmera, Sr. Laurentino Martins, also attended the meeting. The National Director of Aportil, Sr. Lino Barreto, representing the Ministry of Transport and Communications and Co-Chair of the inter-ministerial Technical Team for Stakeholder Engagement, presented the plans for the Tibar Port to the audience, including why Tibar was selected, and what the social and environmental impacts may be. – How will people be compensated if they have to move? – How will the local people benefit from the construction of the Port? – How will the Port affect the livelihood of the fishermen? – What is the environmental impact, particularly on seaweed business and the fishing? – How will the Port affect the salt production in the bay? – Will the Port construction impact on the sites of cultural importance? – What are the disadvantages of the Port? – What are the plans of the Government for the future of the fishermen affected by the Port? 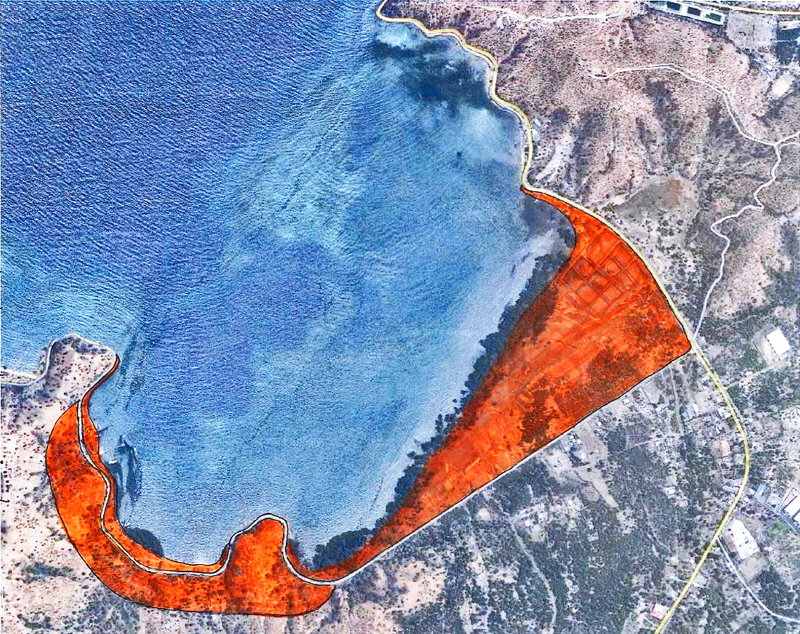 – Suggestion to make a study on how to improve the future livelihoods of the people in Tibar Bay. Some the questions were answered by the inter-ministerial Technical Team, which was represented by MSS, Secretary of State for Environment and Secretary of State for Fisheries, and others will be responded to at the next community meeting or through leaflets. The team noted all the questions and these will be taken into consideration in the continued preparations of the Port. Members of the audience expressed their appreciation of the government having already prepared a team to deal with their concerns. The community was informed about the Focal Point at Ministry of Transport and Communications, Lenty Liu, (phone 3313755), who will forward any questions or concerns from the public to the inter-ministerial Technical Team. Iha dia 11 de Junhu 2014, Governu liu husi Ekipa Tékniku ba engajamentu parseria halao premeiro sorumutu ho autoridade lokais Liquisa nian ho komunidade Tibar. Iha Sorumutu ida ne’e populasaun no autoridade lokais ne’ebe atende mak hamutuk 120 pessoas. Sorumutu ida ne’e loke ofisialmente husi Administrador Liquisa, Sr. Domingos da Conceicao dos Santos, no mos Administrador sub-distritu Bazartete, Sr. Augusto Perreira de Araujo. Iha ocasiaun ida ne’e hetan mos atendementu husi Chefe Suco Tibar, Sr. Bento da Conceicao, no Chefe Suco Ulmera, Sr. Laurentino Martins. Diretor Nasional APORTIL , Sr. Lino Barreto, hanesan mos representante Ministerio Transportes no Komunikasaun no mos hanesan ema ne’ebe lidera Ekipa Tékniku ba Engajamentu Parseria, aprezenta planu Portu Tibar nian ba audiénsia, inklui tamba sa mak Tibar sai hanesan fatin ne’ebe atu hari’I Portu no saida mak impaktu sosiál no ambientál husi projetu ida ne’e. – Oin sa mak populasaun sira bele hetan kompensasaun se sira presija atu sai husi sira nia hela fatin agora? – Benefisiu saida mak populasaun sira sei hetan husi konstrusaun portu ida ne’e? – Ho movimentu cargo ne’ebe mak sei sae, sei afeta movimenetu peskadores sira sira nia servisu, liu2 ba iha rompongs ne’ebe tau iha tasi laran? – Oin sa ho impaktu projetu ne’e ninian ba peskadores sira nia moris? – Saida deit mak sai hanesan impaktu ambientál, liu2 ba negósiu duut tasi no peskas nian? – Impaktu saida mak sei mosu ba produsaun masin iha parte baia nian? – Konstrusaun portu ida ne’e sei impaktu mos fatin kultura ritual nian? – Vantage saida deit mak populasaun hetan husi portu ida ne’e? – Saida mak sai governu plania ona ba futuru atu hare ba populasaun sira liu2 peskadores sira nia moris ne’ebe afetadu husi projetu ida ne’e? – Sujere atu halo estudu ida atu hare ba halo nusa mak hadia liu tan populasaun nia moris iha are portu Tibar. Husi perguntas hirak ne’e balun mak responde ona husi Ekipa Tékniku ne’ebe representa husi Ministerio Soliridade Sosial, Secretario de Estados Pescas, Secretario de Estados Ambiente. Pergunta seluk fali sei hetan respostas wainhira iha sorumutu tuir mai ka sei fo liu husi pamfletus ne’ebe dezenvolve husi Ekipa Tékniku. Ekipa Tékniku hakerek hotu perguntas hirak ne’e no sei tama iha konsiderasaun ba preparasaun prosesu projetu Portu Tibar. Autoridade lokais iha Tibar hamutuk ho sira nia populasaun agredece ba governu ne’ebe prepara ona Ekipa Tékniku atu responde ba sira nia preokupasaun. Iha tempu hanesan, Ekipa Tékniku mos fo hatene ba populasaun sira kona ba Pontu Fokal Relasoens Públikasne’ebe hili ona husi Ministeriu Transporte no Komunikasaun atu simu perguntas no preokupasaun ne’ebe mak karik sei mosu mai ikus, naran no númeru kontaktu ba Pontu Fokal Relasoens Públikasne’e mak, Lenty Liu, (numeru fiksu: 3313755). Pontu Fokal Relasoens Públikas Ministerio Transporte no Komunikasaun ne’e sei refere perguntas no prekupasaun ba Ekipa Tékniku atu responde. The Request for Proposals (RfP) for the Tibar Bay Port PPP has been announced to the four shortlisted bidders on May 14, 2014. The RfP is a detailed instruction issued by the Government of Timor-Leste represented by the Ministry of Finance and the Ministry of Transportation and Communications for the bidders on how to prepare their project proposals. The bids will comprise three parts: Legal Documents, Technical Bid, and Financial Bid, according to the specifications in the RfP. In addition, the bidders have access to a virtual Data Room with relevant information. The four prequalified bidders are 1) Mota-Engil – Ambiente e Serviço, SGPS, S.A. (MEAS), 2) Peninsular and Oriental Steam Navigation Company (POSNCO), 3) International Container Terminal Services Inc. (ICTSI), and 4) Bolloré Africa Logistics (Bolloré AL). The bidders will be invited to a pre-bid conference and site visit in week of 16 June. The bid submission deadline is 22 October, 2014. After the evaluation of the technical and financial bids, the announcement of the preferred bidder is expected on November 27, 2014. The Government of Timor-Leste has set up a Project Evaluation Team, comprising among others representatives from the Ministry of Finance, the Ministry of Transport and Communications, and the National Procurement Commission, with advisory support from IFC transaction specialists, which shall be responsible for conducting the entire bidding process, and in particular for the opening and evaluation of bids. 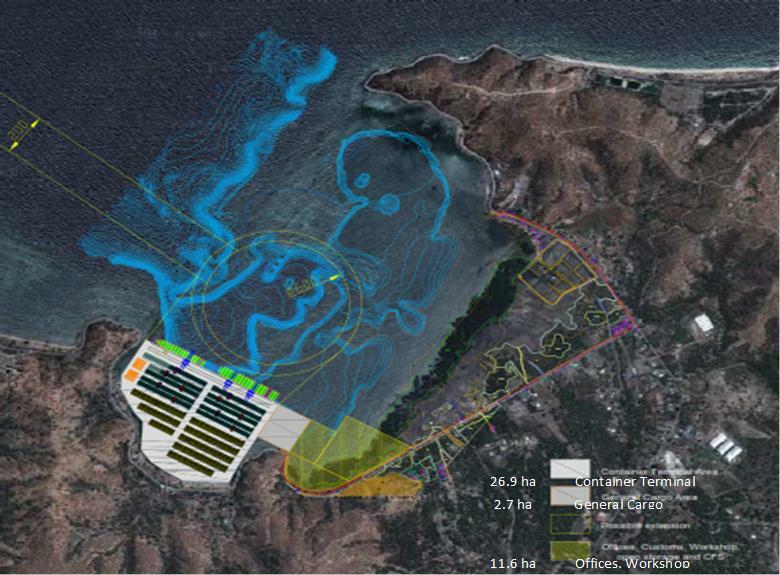 The Government of Timor-Leste is seeking to award the Tibar Bay Port PPP project through a fair and transparent competitive bidding process in accordance with Timor-Leste laws and international best practice. Governu liu husi Comisaun Nasional Aprovisianamentu anunsia ona Pedidu ba Propostas (RfP) ba PPP Portu Baia Tibar ba lisitante eskolhidu hat iha 14 Maiu 2014. RfP ne’e nudar insrusaun detalhadu ida nebee Governu Timor-Leste nebee Ministra das Finanças reprezenta no Ministro dos Transportes e Comunicações hasai ba lisitante sira kona-ba oin sa atu prepara sira-nia proposta projetu sira. Proposta sira ne’e sei kompostu ho parte tolu: Dokumentu Legal sira, Proposta Téknika, no Proposta Finanseira, tuir espesifikasaun sira iha RfP. Nunee mos, lisitante sira iha asesu ba Sala Dadus virtual ida ho informasaun relevante. Lisitante pre-kualifikadu hat ne’e mak 1) Mota-Engil – Ambiente e Serviço, SGPS, S.A. (MEAS), 2) Peninsular and Oriental Steam Navigation Company (POSNCO), 3) International Container Terminal Services Inc. (ICTSI), no 4) Bolloré Africa Logistics (Bolloré AL). Sei konvida lisitante sira ba konferénsia pre-lisitasaun ida no vizita ba projetu fatin iha Tibar iha semana 16 Junhu. Prazu final ba submisaun proposta mak 22 Outobru 2014. Hafoin avaliasaun Proposta Téknika no Proposta Finanseira, espera atu halo anúnsiu lisitante preferidu iha 27 Novembru 2014. Governu Timor-Leste harii ona Ekipa Avaliasaun Projetu ida, kompostu entre reprezentante sira husi Ministério das Finanças, Ministério dos Transportes e Comunicações, no Comissão Nacional de Aprovisionamento, ho apoiu konsultadoria husi espesialista transasaun IFC nian, nebee sei responsável ba halo prosesu lisitasaun tomak, no em partikular ba loke no avaliasaun oferta sira. Governu Timor-Leste buka hela atu entrega projetu PPP Portu Baia Tibar liu husi prosesu lisitasaun kompetitivu ida justu no transparente tuir lei sira Timor-Leste nian no prátika internasional diak liu. District Administrator Sen. Domingos da Concecão dos Santos met with a delegation led by Director General of Ministry of Transport and Communications Sen. Joanico Gonçalves on Monday 19 May in Liquisa. The delegation included members of the Technical Team for Stakeholder Engagement, among others Ministry of Social Solidarity, Secretary of State for Land and Property, SEPFOPE, Secretary of State for Environment, Major Projects Secretariat from Ministry of Finance, and IFC. 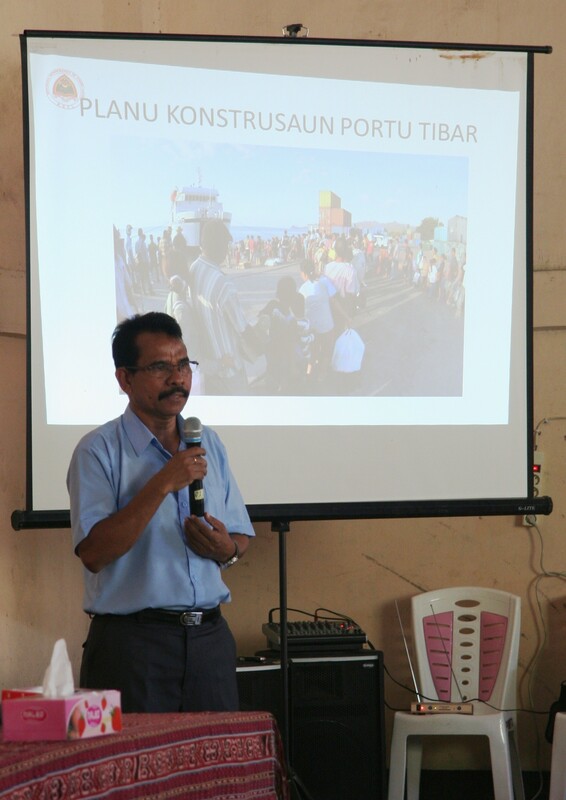 The Director General described the planned Tibar Bay Port PPP and the need to consult and coordinate with local authorities and the community. The District Administrator appreciated the opportunity to be involved at an early stage in the process and agreed to prepare the community meeting together with the chefe suco of Tibar and Ulmera and the traditional leaders (lian nain) and other relevant representatives. Meeting with the community are planned for the beginning of June. The Technical Team will provide support as required in the preparations of the meeting. Information materials in the form of posters and leaflets were made available to the District Administrator and will be displayed in the District Administration Office as well as the Sucu Office of Tibar and Ulmera. Administrador Distritu Liquisa, Sr. Domingos da Concecão dos Santos hasoru malu ho delegasaun ne’ebe lidera husi Diretor Geral Ministerio Transporte no Komunikasaun nian, Sr. Joanico Gonçalves iha Segunda, 19 Maiu iha Liquisa. Delegasaun ne’e kompostu husi membro Ekipa Tekniku Engajamentu` Parseiru nian, Sira ne’e mak hanesn Ministerio Solidaridade Sosial, Sekretariado Estadu Terras & Properidade, SEPFOPE, Sekretariado Estadu ba Meio Ambiente, MPS husi Ministerio das Finansa no IFC. Direitor Geral, koalia kona-ba plano atu hari Portu iha Baia Tibar nian no presija mos halo konsultasaun no kordena hamutuk ho autoridade lokais no komunidade sira. Adminsitrador Distrito apresia ba oportunidade tamba involve sira nia ekipa iha prosesu inisiu molok atu hahu projeito ne’e. Nia mos konkorda atu prepara sorumutu ida iha fulan ne nia laran ho komunidade sira, hamutuk ho Sefe de Suku Tibar, Ulmera, lia nain sira no representante seluk nebe mak iha relevantes. Enkontru ho komunidade sira sei prepara ba inisiu fulan Junio nian. Ekipa Tekniku sira sei suporta tuir nesesidade nebe mak presija ba preparasaun sorumutu ida ne’e. Materia ba informasaun sira ne’e, pepara ona iha poster, pamfletus no brosur. Mateira sira ne sei entrega no monta/taka iha edifisio Administrador Distritu nian nune’e mos iha Sede Suku Tibar ho Ulmera nian. The active participation of the community in Tibar in assessing the environmental and social impacts of the construction and operation of the Port is essential. To facilitate the process a leaflet with basic information about rights and obligations is now available. One of the main concerns for the community in Tibar is obviously how the Port construction will affect the land they are using and any house or other construction they have, as well as any gardens or trees they own or use. The basic principles for the Resettlement and Compensation process is described in this leaflet, and will be followed up with meeting at the community level. Partisipasaun ativu husi komunidade Tibar atu hare no avalia impaktu meiu ambiente no impaktu sosial husi konstrusaun, nomos operasaun Projeito Portu Tibar nian importante tebes atu nune’e sira komprende kona ba projetu ne’e rasik. Atu fasilita prosessu ne’e, ita prepara ona pamfletu ho informasaun baziku nian kona-ba direito no obiragasaun husi parte ida-idak nian. Prekupasaun bot liu husi komunidadi Tibar nian maka oinsa konsturasaun Portu ne’e sei afeta ba rai nebe mak agora dadauk sira uza hela no impakto ba uma ou constursaun nebe maka iha ona fatin neba, nune mos to’os / kantreiro ou ai-hun nebe maka komunidade sira kuda rasik ou uza hela. Prinsipio basiku kona-ba prosesu realokasaun no kompensasaun nian temi mos iha pamfletu ida ne’e. Atu hatene liu tan kona ba informasaun hirak ne’e, sei iha sorumutu ne’ebe organiza husi governu hamutuk ho autoridade lokais iha parte Liquisa no Bazartete atu fahe informasaun ba komunidade sira. This Summary Report is based on the Environmental and Social Scoping Study conducted in June-July 2013. It includes information on estimated environmental and social impact of the proposed port project. A study on the site selection of the port is annexed. In the current phase, until a concessionaire is appointed, the Government is responsible for Stakeholder Engagement for the Tibar Bay Port Project. IFC is advising the Government on implementation of the project, including the Stakeholder Engagement, and will do so in accordance with the Performance Standards of IFC. Later in the year, when the winning bidder is known, it will be responsible for developing and operating the Port in accordance with the Performance Standards, with the role of the Government being supervision and monitoring. In the process of informing the public, and the community of Tibar in particular, a series of leaflets will be made available, covering different topics. The first two leaflets are of a general character. The posters will be exhibited at strategic locations in Dili, as well as in Liquisa. Locations and times for exhibits will be announced shortly. Ministry of Transport and Communication has appointed a Public Relations Focal Point for inquires and complaints regarding the Tibar Bay Port: Lenty Liu, telephone number (+670) 3313755. The Focal Point will register all requests and forward to the Special Panel for Stakeholder Engagement for appropriate action. Relatóru Rezumu ne’e bazeadu ba Estudu Exploratóriu Ambiental no Sosial ne’ebe halo ona iha Junhu-Julhu 2013. Estudu ne’e inklui informasaun kona ba impaktu ambiental no sosial estimadu husi projetu portu ne’ebe propoin ona no mos kona ba selesaun fatin nba projetu nian – mak bele hare iha aneksu. Iha etapa ora ne’e to’o iha nomeia ona konsesionáriu ida, Governu mak responsável ba halo sozializasaun ba Planu involvementu Parseiro Projetu Portu Baía Tibar. IFC akonselha hela Governu konaba implementasaun projetu, inklui invovementu Parte Interesadu, no sei halo ida ne’e tuir Padraun Dezempenhu IF nian. Ikus mai iha tinan ida ne’e, bainhira hatene ona kompanha ida ne’ebe mak mana’an, kompanha ne’e sei responsável ba dezenvolvimentu no operasionalizasaun Portu tuir Padraun Dezempenhu sira, no knar Governu nian mak supervizaun no monitorizasaun. This is not an official translation by the International Finance Corporation (IFC). In case of discrepancies between the original English text and the translated document, the English text will prevail. Iha prosesu informa públiku, no komunidade Tibar em partikular, sei prepara pamfletu lubuk ida, ne’ebe koalia konaba tópiku oi-oin. Pamfletu rua dahuluk iha karáter jeral. Sei taka pamfletus sira iha fatin estratéjiku sira iha Dili no mos iha Liquiça. Fatin sira no tempu ba taka pamfletus ho posters ne’e sei fo-hatene la kleur tan. Ministério dos Transportes e Comunicações nomeia ona Pontu Fokal Relasoens Públikas ida ba inquires no reklamasaun sira konaba Portu Baía Tibar: Lenty Liu, númeru telefone (+670) 3313755. Pontu Fokal sei rejista pedidu hotu-hotu no haruka ba Painel Espesial ba Planu involvementu Parseiro atu foti asaun apropriadu.